Posted by sarahsjoys in Breakfast, Pumpkin, Sauces, Jams, etc. What tastes like fall more than apples and the sweet spices of cinnamon and cloves? I love to make this when the weather is finally cooling and summer is starting to lose it’s grip. It makes the whole house smell and feel like fall is in the air. I think the first time I ever had it, I was back in the United States for summer break and staying with my aunt and uncle. No, it wasn’t fall, but they happened to have some on hand. One taste and I was hooked! I had it every morning on toast for breakfast. It will forever conger up memories for me of sitting at their kitchen counter on glorious San Diego mornings. San Diego summers are kind of like Utah falls anyhow! A coolness in the air with clear sunshine streaming in the windows. This time I added some pumpkin puree leftover from pumpkin waffles earlier in the week. The pumpkin flavor is subtle but adds a nice touch. You could certainly make it with just apples and it is delicious. When I first set out to find a recipe I was missing something for every one I found. Not wanting to go to the store, I made up my own. I hope you like the results! You can use whatever apples you want. I like to use a combination. I think it gives a more balanced flavor. For this batch I used Gala, Granny Smith, and Fuji. The quality of your apples does matter and that can vary greatly! 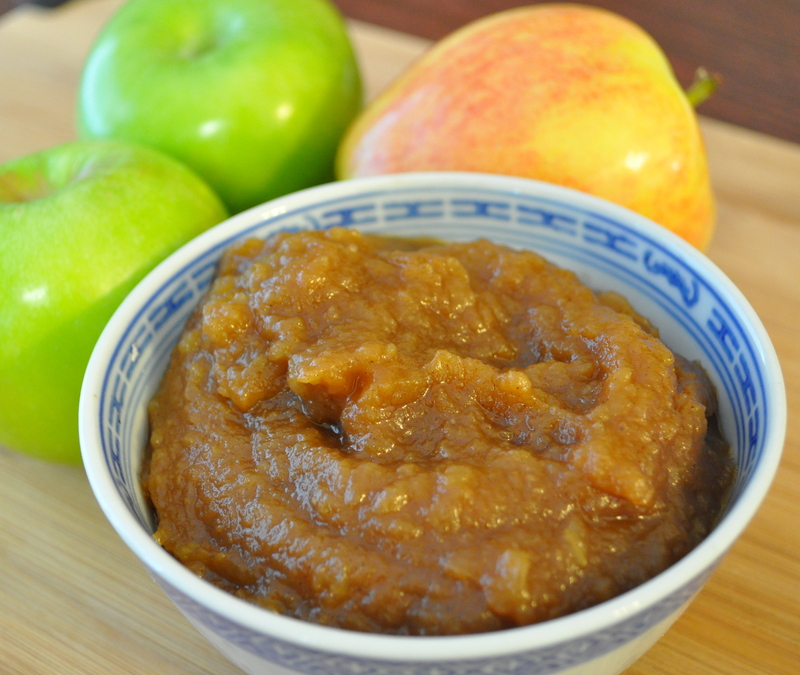 Many years ago I made the most amazing batch of home made applesauce from Fuji apples. Sweet, sweet, sweet with no sugar or sweeteners added! Thinking I would do the same the next year I bought Fujis without a second thought and it was the worst batch I’ve ever made. Totally flavorless. Ask your produce guy to sample the apples before deciding which varieties to use. They will happily cut into one to let you taste. Feeling lazy, I also peeled and cored my apples ahead of time. It’s more work upfront but makes the puree process at the end much simpler! You don’t have to worry about separating the flesh from the peels (which usually means a lot of bonding time with your food mill or chinois.) But if you really want to do it the old fashioned way you can chop the apples up without bothering to peel and core, then push through a chinois at the end. Maybe it’s because I have kids now, but I’ve come to prefer less mess and work and use my immersion blender! Place all ingredients in a dutch oven or large, heavy saucepan. Alternatively you can throw all the ingredients into your crock pot and cook on low for 8-10 hours. 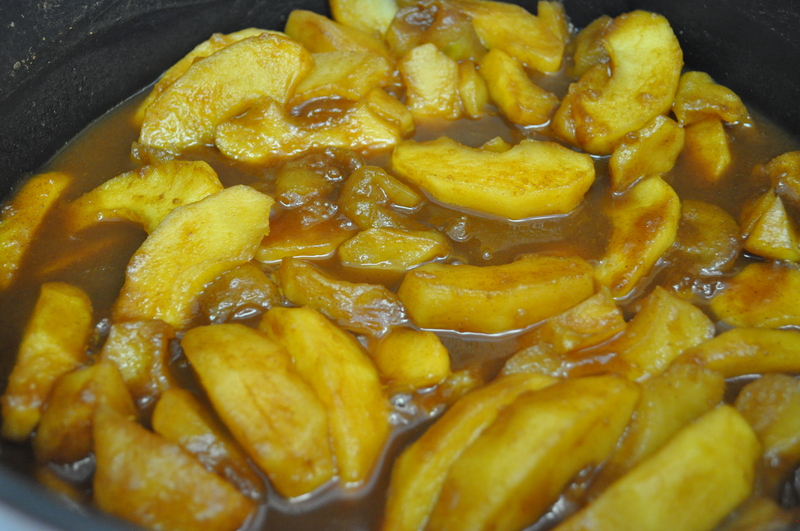 Bring to a simmer, cover and allow to cook for 1 hour or until apples are very tender, stirring occasionally. 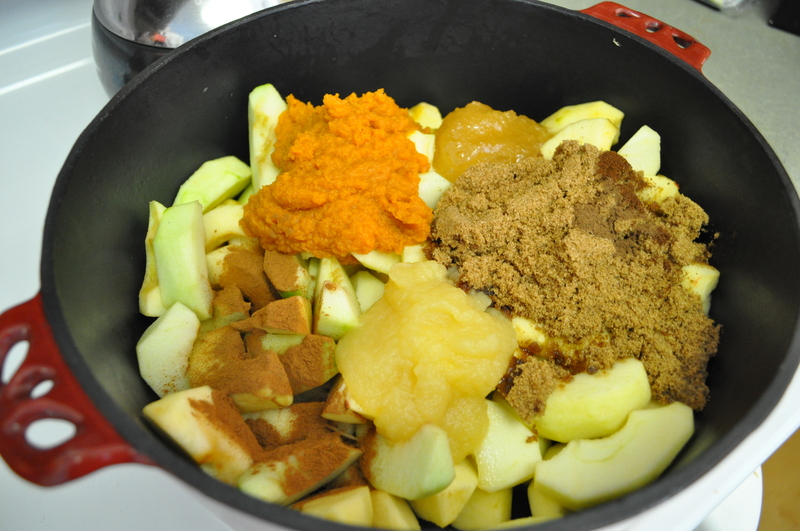 Use an immersion blender, food mill, or chinois to puree until smooth. If it is still slightly runny, allow to simmer uncovered for 15 more minutes. How many jars does this make? I might have to try it! Could I just put it in a blender if I don’t have an immersion blender? I can’t remember exactly, but I think it made about 7 cups. (I filled two jars that were larger than normal canning jars and 3 one cup jars) The blender would work but I would do that before it is reduced all the way, then put the puree back in the pot and let it finish reducing until it’s thick.